After several hundred miles on the road, your windshield will be a dirt-smeared, oil-spattered insect graveyard that requires attention far beyond the capabilities of a typical gas station squeegee. The best truck stops provide thick brushes to scrub away debris, extra-long windshield washer handles to reach every grimy inch of glass, and ample washing fluid mixed with the water. Cold Pop Tarts for breakfast and peanut butter sandwiches for dinner might be adequate for a day or two when you’re trying to make good time on the road, but there’s something special about a hot meal that didn’t come from a drive-through window. Some truck stops have restaurants open 24 hours, and others specialize in region cuisine. If you stop at Golden Acorn Casino, you have multiple options: dining at the Golden Grill, grabbing a quick wholesome snack at the Del Oro Deli, or relaxing at the Player’s Bar. It’s officially road trip season. 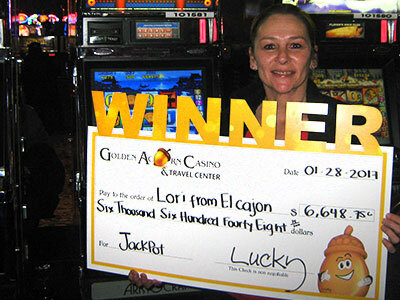 At Golden Acorn Casino, we have the feeling it’s going to be an epic summer. If your road trip happens to take you through Southern California, we’ve got a few ideas for you. Yes, of course, you’ll want to hit the beach, maybe try a surfing lesson, but if you’ve got a taste for something quirky, spooky, glute-busting, or just plain off-the-beaten-path, try this list of must-see stops while traveling through Southern California. 1) Sunny Jim’s Cave – Adventurers can explore this cave in La Jolla that was once used to smuggle Chinese immigrants and contraband whiskey during Prohibition. The cave also has ties to L. Frank Baum, author of The Wizard of Oz.